In this post we will be discussing some known but not-so-famous features of static members in C#. It is possible that you might be already aware of these special features. Let's consider Student class. This class only has a single static member MessageOfTheDay. <Label Content="Message Of The Day" Height="27" HorizontalAlignment="Left" Margin="8,0,0,0"
<Button Content="Demonstrate static variables across AppDomains" Height="34" HorizontalAlignment="Left" Margin="6,265,0,0"
As you can see this Window has a single text box and a button. Clicking the button handles the Click event of the button using btnSetMessage_Click handler. The handler assigns a new value to MessageOfTheDay static member of Student class. This also executes displayMessage callback in a different application domain appDomain and shows the value of Student.MessageOfTheDay in this application domain. 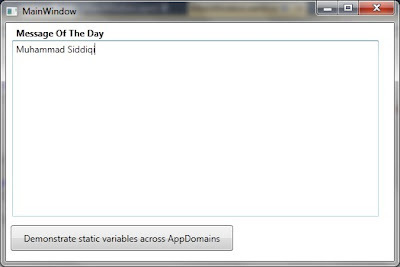 In order to prove that the current domain still holds the text entered in the textbox, we are showing the value [in the Base AppDomain] of Student.MessageOfTheDay. Let's run this and enter some text in the TextBox. Let's Enter "Muhammad Siddiqi". So after clicking the button there would be two message boxes displayed. Can you guess the messages in those message boxes? This proves our point. 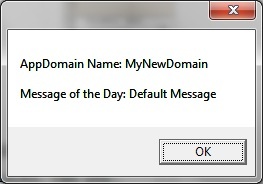 Although we have set Student.MessageOfTheDay in the current domain but the change is not visible in the other domain as they are isolated. In words: Initializers are executed from child class to base class. The same is true for the value assignment to the constructors in the inheritance hierarchy. The constructors, themselves, are executed from Base class to child class. Additionally, the constructors are always executed when both initializers are value assignment is finished. So in the case of static members also, the static initializer is always executed before static constructor. Based on this discussion, you would always find the value of a static field as set in the static constructors when you would use it first time if they are set in both static initializer and static constructor. This is exactly as we discussed above. Can you guess what would be the contents of the MessageBox? Now verify if it matches from actual Message box. As you can see that both specific type generated for Generic holds different values of static members, so they are not shared. 1. Static members are not shared across application domain. 2. Static constructors are always executed after static initializers. 3. Static members are not shared across different specific type generated for Generics.